This image shows a message on the Direct Pay section of the IRS website on Tuesday, April 17, 2018. The IRS said on its website that its online payment system became unavailable at 2:50 A.M. ET on Tuesday. The IRS did not have an immediate explanation for the failure. 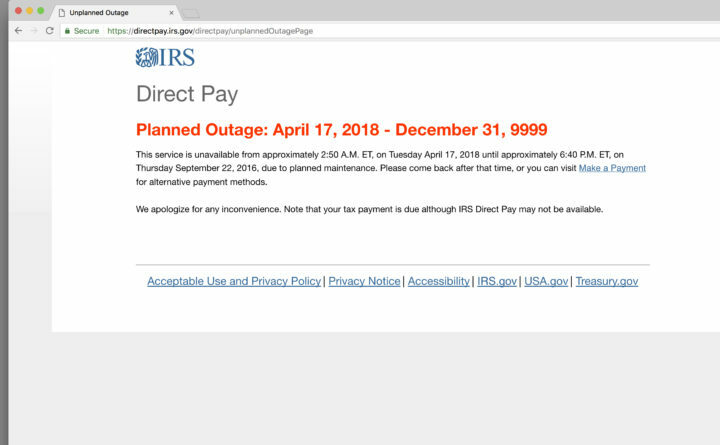 Americans who waited until the last day to pay their taxes got an unwelcome surprise: The IRS website to make payments and access other key services is down. The IRS still expects Americans to pay their taxes but U.S. Treasury Secretary Steve Mnuchin says extensions will be granted to those impacted when the site is up again. The IRS said in a statement that “certain IRS systems are experiencing technical difficulties.” It also said that at this point, the problem appears to be a hardware issue. The problem is, electronic filing is the most popular way to file. And the IRS offered no immediate solution but said the returns will be processed when feasible. However, Mnuchin who oversees the IRS, said that they expect the direct pay system to go up shortly. Pages on the IRS website (www.irs.gov) used to view account information, make a direct payment or set up a payment plan were all not functioning most of the day Tuesday. It’s unclear when and why the failure occurred. But it appears, based on a message on the site, that the online payment system became unavailable at 2:50 A.M. ET that morning. It’s unclear how many people were impacted Tuesday but, by comparison, about 5 million tax returns were filed on the final day of last year’s tax season. The IRS snafu also caused problems for popular third-party tax preparers such as Turbo Tax and H&R Block. Both said that they will hold onto customer tax returns and file them as soon as the IRS system reopens. Tax day falls on April 17 this year because April 15 was a Sunday and April 16 was Emancipation Day, a holiday in Washington, D.C.
IRS Acting Commissioner David Kautter testified during a House Oversight Hearing Tuesday that a number of systems are down at the moment and that the agency is working to resolve the issue. Trump’s top economic adviser Larry Kudlow offered a deadpan reaction when asked about the failure.